Abstract: Forbes Magazine calls data storytelling 'the essential data science skill everyone needs'. And with good reason – well told data stories are change drivers within the modern organization. But how do we find the most important insights in our business data and communicate them in a compelling way? Bio: Isaac is an Australian data scientist, company founder and TEDx speaker who lives, breathes and dreams data. 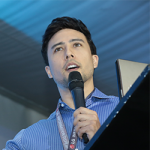 Isaac travels the world teaching data visualization skills and in 2017, his "Art of Data Storytelling" speaking tour saw him visit Asia, North America, Europe and Australia. A passionate data science educator, Isaac previously lectured in analytics and statistical theory at the Australian National University. He has delivered his Data Storytelling course on site to forward thinking companies including Cisco, AIG and JPMorgan Chase. Isaac was a featured data visualization keynote presenter at the 2017 Strata Data Conference and makes regular appearances at data conferences.